Birdhouse Contest 2010 | Daylily Blog on Letting Go! 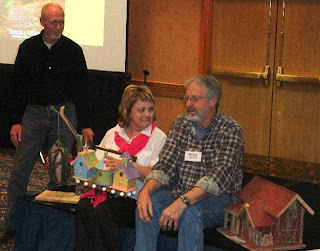 The Region 2 Winter Symposium offered a new contest in 2010 - a Birdhouse Contest! There were a lot of intricate rules, but generally you had to decorate/build/sculpt or otherwise create a functional birdhouse. A winner would be chosen by a panel of experts and all entries would be auctioned off for regional benefit during the live auction. I decided to enter. About a month before this contest, my husband and I spent a long weekend in New Orleans, and took some time out to visit Musician's Village, an amazing post-Katrina social enterprise. I have always felt a cosmic attachment to this city, this visit was no exception, and I decided to model my birdhouse entry after the Musician's Village. I was inspired by the colors, the playful accents and the bare wood surfaces. I purchased five pre-assembled, unfinished birdhouses from a local craft store and set off on the journey. Each birdhouse had many coats of acrylic paint and were sealed with Triple Coat Outdoor Spray Clearcoat. I mounted the three houses on a plank of treated wood and trimmed the base with white wooden balls - reminiscent of the houses I saw in NOLA's Musician's Village. To the wood base, I attached a piece of hardware that allows the whole thing to be affixed on the top of a 4" X 4" fencepost. It turned out awesome, and I was really leaning toward not entering it into the contest because I really wanted it in my own garden. But, I decided the worst thing that could happen is that I would have to bid to get it back, and I was sure the bidding wouldnt go too high I couldnt win it, so I entered it in the contest with the plan to buy it back from the region if it came to that. Well, out of like 20 or so entries, I came in second! WOW! The birdhouse was a hit. I was proud of it! Then came the auction. Uh-oh. There were so many cool birdhouses entries to bid on. I won two before mine was even up for bid. I was the auctioneer when my birdhouse came on the block. $25. $50. $75.....oh my. Oh no. The price kept going up and up and up and up! Long and exciting story short, I did not win back my birdhouse, but it went to a fabulous home at Browns Ferry Gardens and the region made a good chunk of money from the birdhouse contest overall. Over the summer, Bob Faulkner sent me this photo of Heidi Douglas in their gardens - notice the birdhouse in the background? 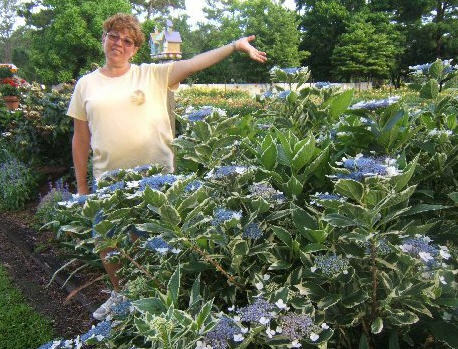 It looks awesome with her hydrangeas. Hooray! P.S. The photo at the top is of the first, second and third place winners (from left to right.) The winner was an intricately sculpted birdhouse that was amazing. Duane Nickel's third place effort was built from the "ground up" and was wonderful, too. I was outbid on both of those and sadly did not bring either of them home.